When I first opened the Cuba chapter in Chef Jose Garces’ The Latin Road Home: Savoring the Foods of Ecuador, Spain, Cuba, Mexico and Peru, I held my breath for a moment. It’s always a little strange to see yourself through someone else’s eyes – well not me exactly but the food I grew up which can feel like the same thing. My first instinct was to jump ahead to the recipe for the sandwich Cubano – not only did he keep his version free of chipotle mayo, but mentions Miami’s Latin American cafeteria and includes directions for sugar-cured pork. I kept reading. I shouldn’t have been surprised. His Cuban wife Beatriz is a steady presence throughout the book. His obvious affection for his Cuban in-laws spills over into his descriptions of afternoon cafecitos and fending off her extended family at Nochebuena pig roasts (referring to them as well-dressed vultures who need to be kept at bay with a knife kit might be the best way to make them respect you). Having visited the island himself, he makes clear distinctions between the cities he visited – Havana, Cienfuegos, and Santiago – that are often overlooked. Looking for a recipe, there was a lot to try – seared scallops topping rabo encendido and creamy tamal en cazuela, sweet cachucha peppers lightly battered and fried, and cardamon-mint syrup blended into a stormy mojitos for a start – but I chose the ropa vieja con frijoles colorados. For years, my family has been telling me I should use a pressure cooker for slow-cooking beef stews, while warning me that it will most likely explode as not, and following this with maddeningly imprecise directions on how to go about it. If there was an area where I needed a chef’s intervention, it was here. At first glance, it was not the same ropa vieja I was familiar with. 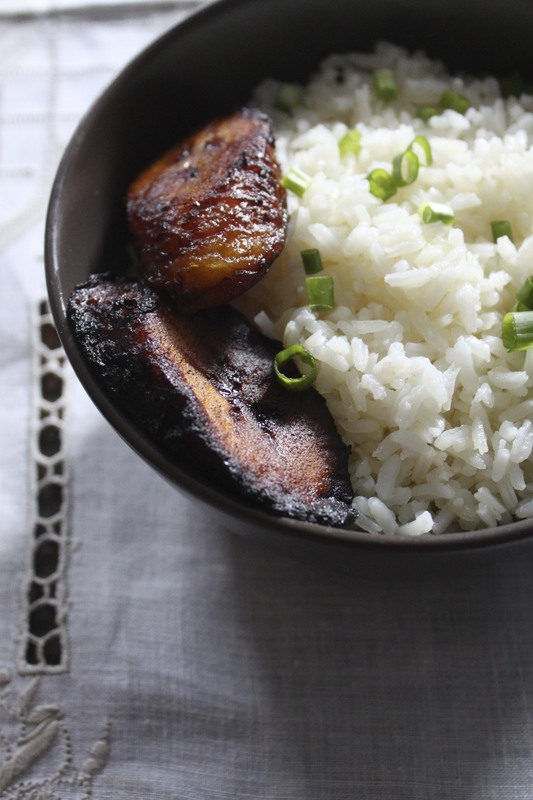 He uses short rib instead of the traditional flank steak. Beyond fork tender, it collapsed in a heap the moment I lifted it out of the cooker. The onions and peppers are sautéed slowly each time, bringing out the sweetness before proceeding to the next step. It calls for heaping amounts of cumin which could have been overwhelming but, toasted and freshly ground, was wonderful. Admittedly, I had to resist the urge to throw in a bay leaf and slice up some pimientos, more out of superstition than anything else. Still, it was great to see a new take on an old favorite, so I followed the recipe to the letter. One recipe down, I’m looking forward to cooking my way through the rest of the book. By focusing on cuisines that share so much in common, it revels in the differences. As someone who crosses borders all the time in the kitchen, I appreciate how hard it is to get it right. Still, when you trust the guide, you’re happy to go wherever they take you. 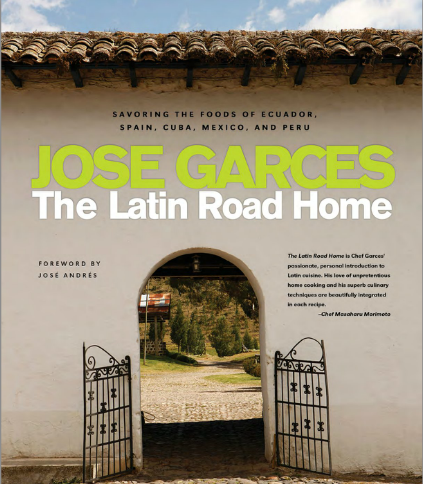 Reprinted with permission from The Latin Road Home: Savoring the Foods of Ecuador, Spain, Cuba, Mexico and Peru by Jose Garces. Published by Lake Isle Press, October 2012. To prepare the braised beef, heat 2 tablespoons of the oil in a large cast-iron skillet over medium-high heat. Generously season the meat with salt and pepper. Sear it until well browned, 3 to 4 minutes per aside. Set aside. Heat the remaining 2 tablespoons oil in a pressure cooker over medium-high heat until it shimmers. Add the bacon, onion, bell peppers, and raw and roasted garlic. Cook until the onion in translucent, about 10 minutes, stirring frequently. Stir in the tomato paste, cumin, and vinegar and cook until the mixture is lightly caramelized, about 5 minutes. Add the stock, seared short ribs, and kidney beans. Close and seal the pressure cooker over medium-high heat for 1 hour. Prepare and ice bath in the kitchen sink. Transfer the still-sealed pressure cooker to the ice bath and leave it to cool for 5 minutes. Lift the pressure cooker of the ice bath, carefully unseal it, and remove the lid. Lift the short ribs out of the cooker, the meat should be soft to the touch and fork-tender. While the meat is still hot, shred it with a fork and set aside. Measure out 1 quart (4 cups) of the braising liquid and set aside (return any beans to the pot). 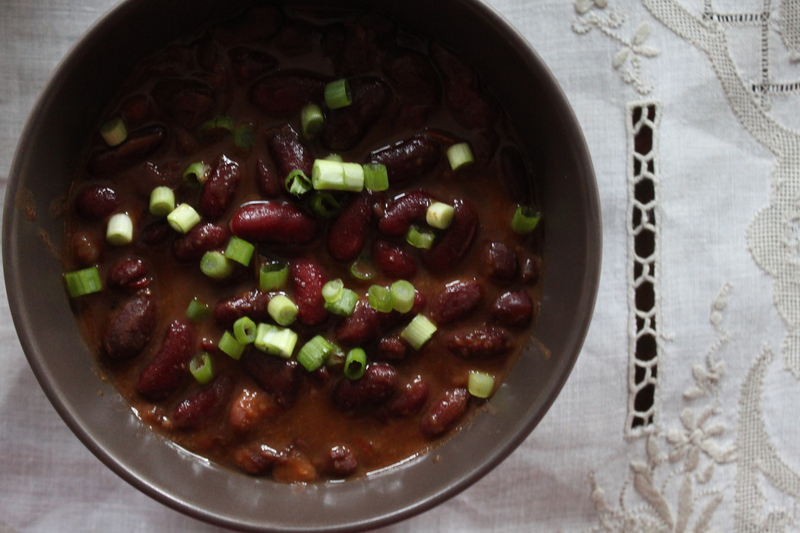 To finish the beans, transfer the contents of pressure cooker to a saucepan and cook over medium heat, stirring occasionally, until the liquid thickens, 18 to 20 minutes. Meanwhile, to make the sauce, heat the oil in a large sauté over medium-high heat. Add the onion, bell peppers, and garlic and cook until translucent, about 10 minutes, stirring frequently. Stir in the tomato paste and cook until the mixture is caramelized, about 5 minutes. Add the reserved braising liquid and cook until reduced by about half, about 15 minutes. Add the meat and stir to incorporate. Fold in the parsley, cilantro, and tomatoes and season to taste with salt and pepper. 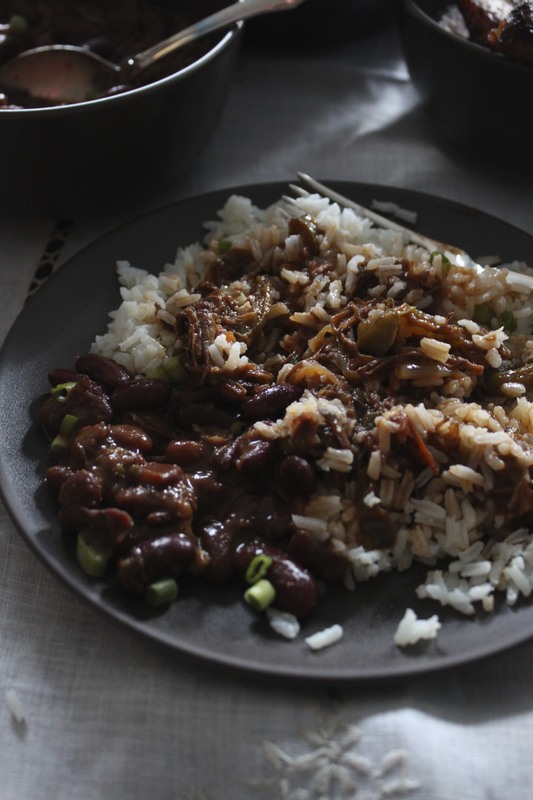 Serve the ropa vieja and beans with rice and plantains, garnished with scallions. 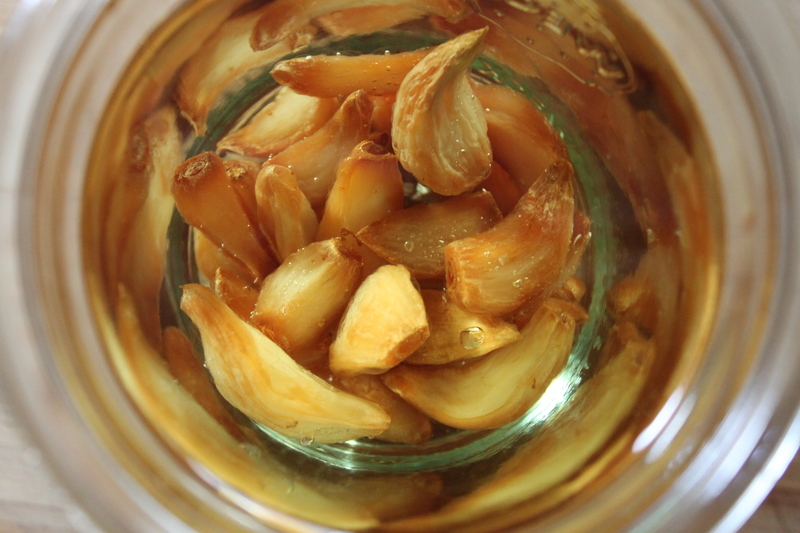 *According to Garces, roast the garlic, combine 1 cup of peeled garlic with 2 cups of vegetable oil in a baking pan. Preheat the oven to 325ºF. Tightly cover in aluminum foil and bake for 45-60 minutes. Allow to cool before transferring to sealed container. Can be kept refrigerated for up to 2 weeks. **Add the cumin to a dry skillet over medium heat. Toast until fragrant, stirring constantly. Grind in a coffee or spice grinder. I love Cuban food. By far, it’s the most similar to Brazilian cuisine. This Ropa Vieja looks so appetizing… I’ll keep in mind to try it with beef short ribs instead of flank steak next time. It’s good to have a good recipe to put my pressure cooker in use. I’ll have to check Iron Chef Garces’ book out. Buenas noches!!! Hola, Amiga: Since I learned how to use my pressure cooker, it has been an adventure to cook for my family and friends, and very easy. For this recipe, I always saute the beef in apple vinegar the night before and, after I arrive home at 6:30, and get going, by 7:30, voila!, my dinner is on the table. Before I close the lid I sear the beef on each side, and then add the “sofrito” and other ingredients. 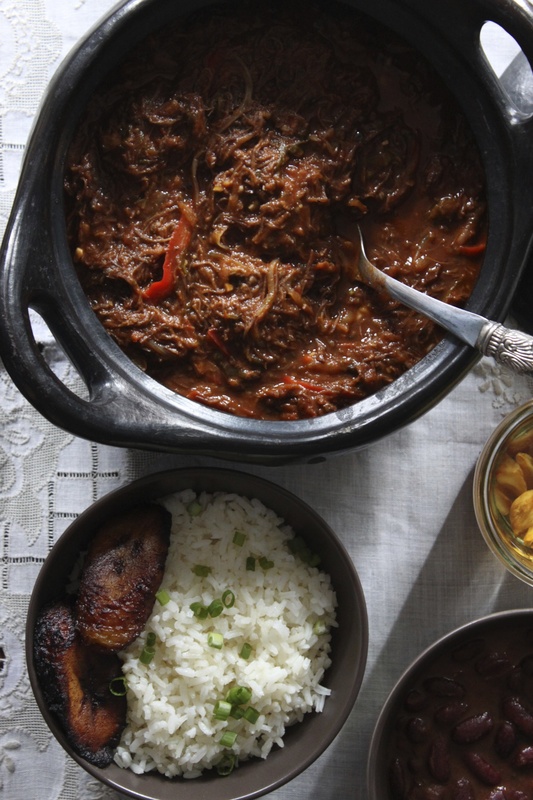 This Ropa Vieja by Garces seems intriguing. But I just don’t use too much cumin in my recipes and, when I do, is powder cumin, which I know how to control better, usually 2 teaspoon (for 1 pound of beef). But, of course, the art of cooking is according to taste and intuition. Your site is a delight, Thanks. By the way: When in Miami, two of the places that serve wonderful “Ropa Vieja,” is ” La Habana Vieja,” in Coral Way, (4 stars) and La Carreta, (3 stars) across Versailles Rest., on Calle Ocho (S. W.,8th Street.) There are others but those are two that come to mind. This is beautiful! Your writing, pictures and recipe suggestions. I must get this book and a slow cooker. The title of this post is exactly why I started cooking in the first place. When I moved from California to Philadelphia, I started cooking to connect to home, to that intersection of Mexican and Californian cuisine that was comfort. But, oddly enough, moving opened my horizons. 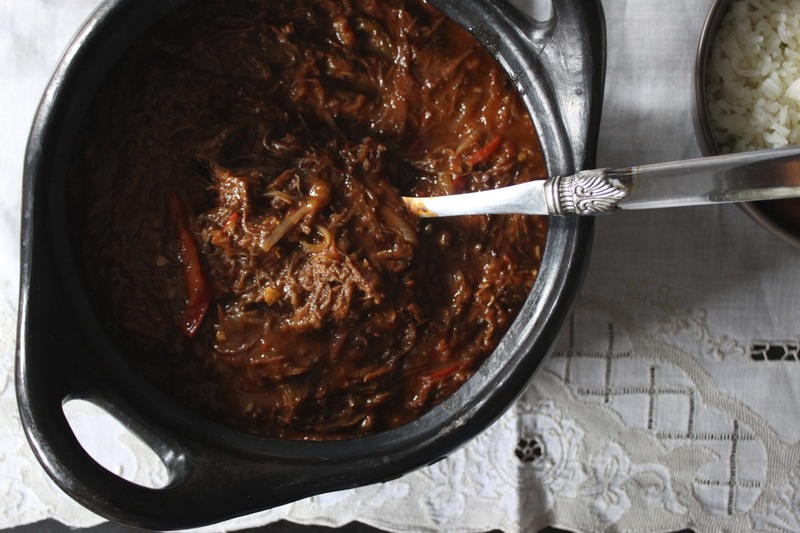 Our first apartment was over a Cuban restaurant and one of my favorite meals quickly became ropa vieja. Thanks for the recipe! I would eat this every night of the week if I could. Looks so good. My brother in law is Cuban and his mom on occasion would cook us some really great Cuban food. I am salivating.